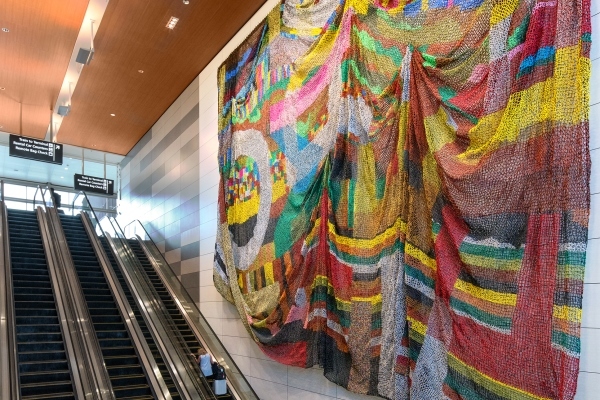 The art & the artist: Chicago-based artist Nick Cave has designed a contemporary dimensional tapestry made primarily of beads. The title of this piece refers to something that has been reused but still bears visible traces of its earlier form – picture a graffiti-covered wall where each new image builds on top of earlier work but doesn’t totally replace it. The hanging sculpture is a contemporary palimpsest focusing on the themes of travel to understanding, creating a web of humanity and also the creation of future memories through the travel process. The pattern reflected in the tapestry is “home free.” Cave is a world-renowned artist. Previous works include the Lights on Tampa installation and work for the United States Embassy in Dakar. This contemporary palimpsest is a monumentally scaled, hand-made, holder of memories, past, present and future. It is a conceptual web of travels, coded by color and steeped in human connection. It hangs as an energy field that both welcomes one home and wishes one well on their next journey. Each bead, series of colors or bustled field holds the stories of the many makers that worked daily for over 10 months to create Palimpsest. Now complete in its new home, it is ready to receive your stories too. The art & the artist: The light installation “Symbols, Systems & Proportions” is a hanging sculpture that consists of three curtains of 81 programmable light panels. Each light panel displays a symbol or a pictogram commonly found at Tampa International Airport, such as an image of a plane, telephone or escalator. The images were adopted from the sign design manual that all airports around the world use to communicate with passengers. There are a total of 27 different symbols displayed on 243 stained glass panels. Each light panel is internally illuminated and the color as well as the brightness is programmed in slow, soothing light sequences allowing for a multiplicity of narratives. Redl is famous for incorporating hanging sculptures that shift perception based on where people are moving. In this piece, the hanging panels with the LED lighting will maneuver in an animated fashion. Depending on the time of day, the sculpture has a stained-glass effect, filtering and transforming the sunlight streaming in through nearby windows. Even in broad daylight, the power of these LED lights captivate in vivid, bold colors that passengers are able to see and enjoy while transiting down escalators to their rental car. Redl, born in Austria, is now based in New York and Bowling Green, Ohio. The installation utilizes pictograms used at an airport to playfully analyze the complex relationship between symbols and the objects they represent. The visual system employed in this process draws from the very foundations of perception, which is to use our collective visual memory to interpret new optical stimuli and infer meaning. The artwork uses multiple instances of each pictogram, one per light panel, against different color backgrounds. The light panels are arranged in three curtains. Each curtain has 81 panels aligned in a 9 by 9 grid. The light panels combine translucent color gels and LED lighting. The sunlight streaming in through the window creates a stained glass effect, and a hybrid of this ancient technique with contemporary lighting technology emerges. The art & the artists: This hanging kinetic sculpture is all about movement. The artists, well known for their kinetic art, are creating a flurry of kinetic elements that float above the viewer and respond to even the slightest currents of air. Each cluster measures six feet by eight feet and consists of small rectangular brushed aluminum plates. 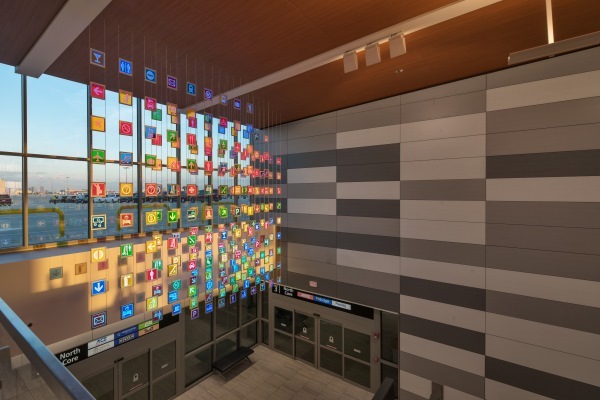 In total, ten clusters of freely moving reflective elements extend along the station for roughly 100 feet. The changes in air volume are reflected in a fascinating and complex series of movements overhead. Crosscurrents is a flurry of kinetic elements floating above the viewers and responding to the slightest currents of air. Our work in kinetic sculpture concentrates on the movement rather than the object. We take it as an article of faith that the air around us moves in ways that are organic, whimsical, and unpredictable. We therefore assume that if we were to abdicate the design to the wind, the work would take on these same qualities. The engineer wants to minimize friction to make the air visible. The art & the artist: Greetings from Tampa Bay is a two-phased public artwork. It began with a performance-based, socially engaged work in which Tampa Bay residents were invited to share stories and memories about their cities. In the second phase, hand-typed stories and photos – both contemporary and historical – were printed on aluminum and form the material for the sculptures. Oring, of Greensboro, N.C., put on three performances to capture these opportunities. Oring is well known for her examination of critical social issues through projects that incorporate old and new media. In 2013, she created “Travel Desk” for San Diego International Airport. For that performance, typists dressed in 1960s-era flight attendant uniforms and took down peoples’ stories. The art & the artist: n + 1 is a dramatic two-part sculpture. 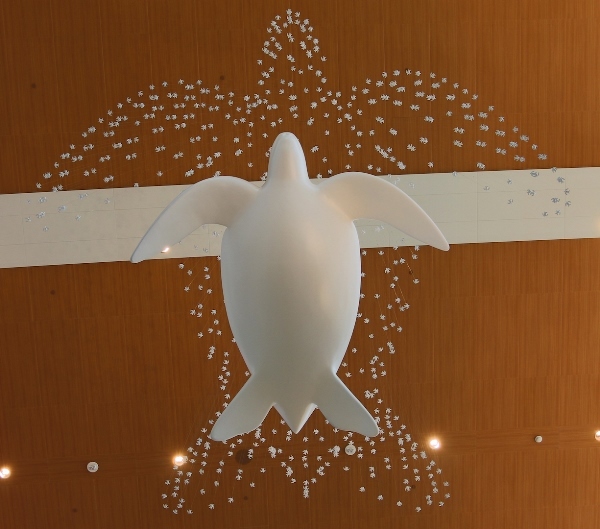 It is suspended above an opening to the third floor and consists of a ten-foot-wide primary sculpture of a large opalescent ivory-white leatherback sea turtle. Suspended above that primary sculpture, hundreds of fine cables hold a thousand small sculptures of turtle hatchlings that collectively coalesce into a particulate twenty-five-foot wide adult turtle, identical in shape and morphology to the sea turtle below. Viewed from below, where many passengers will see it, the sculpture will almost look as if it is gliding through the air. Helmick is a world-recognized sculpture artist inspired by the connection between wildlife and humans. 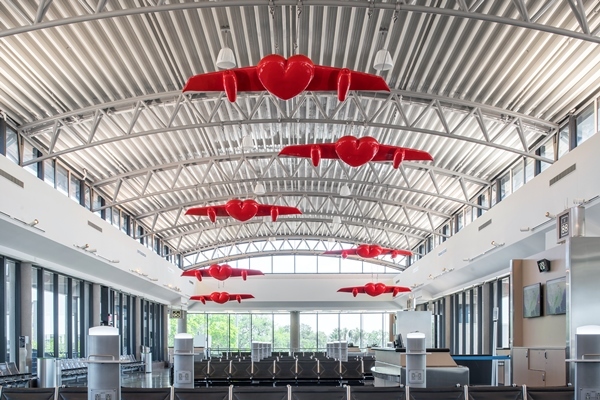 The art & the Artist: Good Bye My Love Tampa Seven Days a Week expresses the myriad of reasons why people choose to take a plane and the different ways in which we think about flying when at home or at an airport. Each of the 7 wings of the sculpture represent a day of the week. Born in Cuba, Segura has exhibited in Cuba, US, Germany, Spain, England, Argentina, Brazil and Italy. Good Bye My Love Tampa Seven Days a Week embraces the majestic and mythic relationship between humanity and aviation. It is an expression of the way the soul and imagination are elevated by flight; and the ways in which airports themselves give access not simply to machines that fly but to the world’s staggeringly diverse heritage of cultures, histories, and individual human lives. 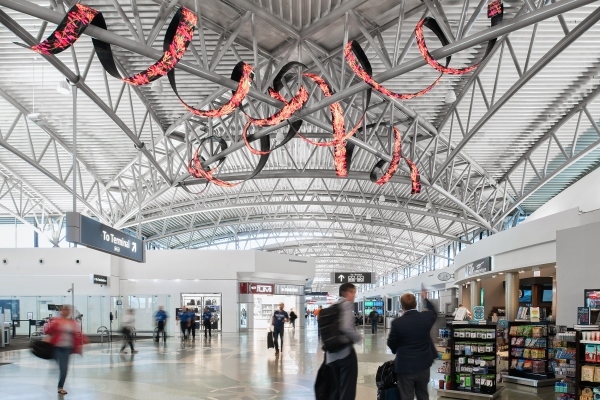 The art & the artist: Tendril is a hanging sculpture made of ribbon-shaped metal strips and LED screens that coil around the trusses of Airside F’s central space. The flexible LED screens display time-lapse video animations showing the growth of Tampa Bay’s native flora, evoking the image of native vines curling around a trellis. The installation is a continuation of the artist’s fascination with “representations of ruins that depict nature reabsorbing what was built by humans.” Daniel Canogar, based in Madrid, Spain, is a visual artist specializing in photography and video, and creating new media installations. He’s always wanted to make artwork for an airport. “Got my wish,” he said. 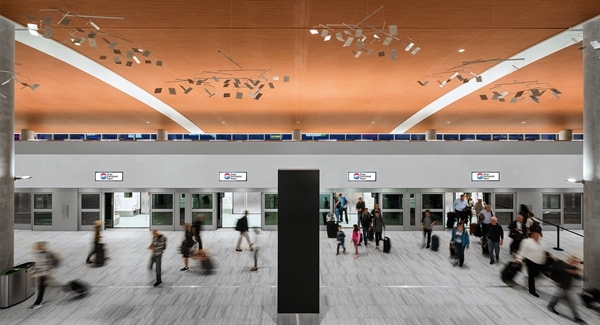 Tendril is a sculptural LED screen that coils around the existing truss system of the Airside F terminal. The shape of the artwork is reminiscent of vines and features animations of native South Florida plants. The videos will suggest vigorous reclamation of territory, shifting from fast invasive gestures to tranquil sequences of species settling in their new home. 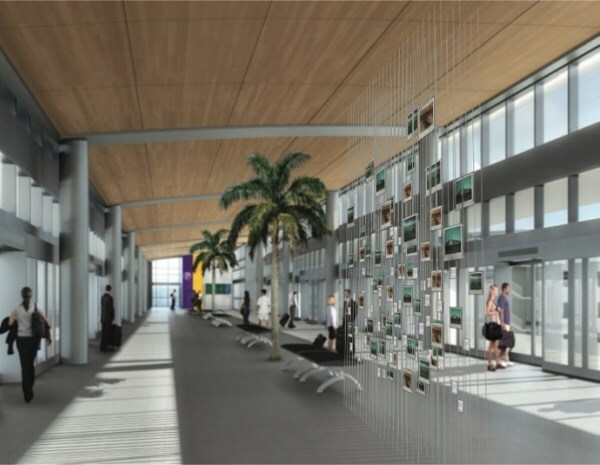 The native plants are invited into the interior of the Airport, thus connecting indoor with outdoor space. New animations of plant motifs can be added through the years, allowing the Artist to treat the Artwork like a garden, tending to it by planting new content. The content on the screen will not be a looping video. Instead, a computer program will generate real time content using an algorithm. The algorithm will be programmed to randomly decide on the life-cycle of the depicted plants: speed of growth, how branches fork, density of foliage, color and shape of leaves, etc. The generative artwork thus imitates the complexity and randomness of nature itself. 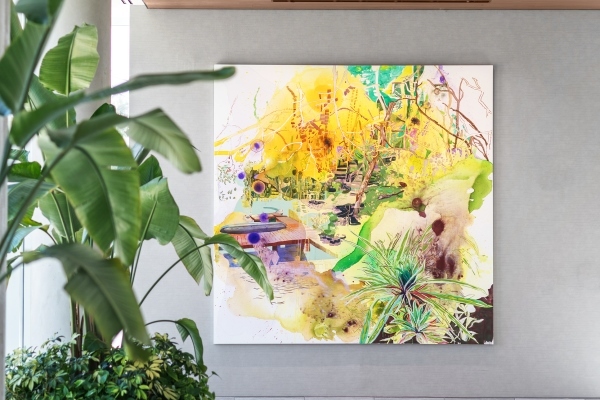 The art & the artist: This mixed media landscape painting combines the literal and the abstract using pours, abstract gestures, representational drawings, traces and collage elements to depict the Tampa Bay region. The painting balances external views of the landscape with an internalized version that is inviting and restorative. Elisabeth Condon is based in Tampa with an office in Brooklyn, NY. A former tenured instructor at the University of South Florida, she left her position to take on creating art full time. Inspired by scroll painting, Verdant Tampa Bay’s unfolding composition reveals trees in Lettuce Lake Park, Selby Gardens foliage and the Hillsborough River flanked by bridges, docks and makeshift scholars houses. The painting unites scroll painting’s time lapse sequences in pours of paint, a hallmark of 20th century western postwar abstraction, to convey movement and the multiple associations that arise with travel.